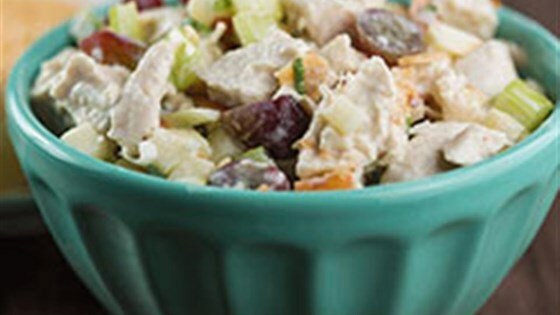 "Chicken salad with chopped apple, celery, and grapes in a creamy Dijon mustard dressing is topped with toasted coconut and almonds." Lightly toast coconut and almonds for about 5 minutes. Check often--coconut may brown first. Set aside. Whisk together yogurt, Silk, garlic powder, lemon juice, cider vinegar and mustard in a large bowl. Add remaining ingredients (except toasted coconut and almonds), tossing to combine. Top with toasted coconut and almonds to serve.